Winston Churchill, Britain’s prime minister during most of World War II, famously admitted after the War that the German U-Boats were the only thing that had really frightened him, and during certain periods it is easy to see why, with large quantities of allied shipping and supplies lost to them, particularly in the Atlantic. Their near-invisibility prior to an attack added to their perceived menace, and arguably their impact was out of all proportion to the relatively small numbers of men involved, yet for those men the service was extremely uncomfortable and very high risk. 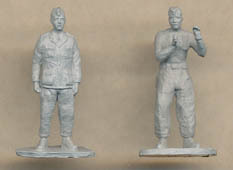 By the end it has been estimated that between 75% and 80% of U-Boat crew lost their lives, and while the numbers involved pale compared to those in land battles such as Stalingrad, those men played a very significant part in the War, and are depicted in this and the two companion sets for the first time. As usual these 3-D printed figures have been made in a semi-clear plastic which makes them very hard to see in our photos, so we have painted one pose and primed a couple of others to give a better idea of what these figures actually look like. This set is subtitled "with Schiffchen caps", by which it means the Bordmütze, the fore-and-aft side cap popularly known as the Schiffchen. Every man here is wearing one, which is good as this was a very popular and widely-worn cap. Other than the cap however the dress shows quite some variety, so in our scans we have grouped the men based on their clothing. The first thirteen men are in shirt sleeves, generally with the sleeves rolled, which was common wear in the very hot and damp atmosphere of a U-Boat. The next two seem to be wearing overalls, though it is hard to be sure given the material used, but the remaining three poses in the third row are clearly stripped to the waist. The last two rows all contain men wearing a tunic with at least one breast pocket as well as skirt pockets, which means it must be the tropical tunic. All these forms of dress are reasonable, and since most U-Boats operated a quite relaxed policy on uniform everything here is perfectly usable. The tropical tunic is much the least common item, and it would be wrong to suggest it was as widely worn as some other clothing which is not represented here at all, so these figures are not a typical cross-section of the appearance of U-Boat crewmen, particularly as none are wearing shorts or sports gear. However individually every man is reasonably dressed, and naturally no one has any form of kit, so authenticity is first class. The all-different 30 poses are all essentially of men doing something, with arms and hands in various positions as if operating equipment, which is exactly as you would expect. Some stand and some sit or kneel, but most are pretty generic and all the more usable for it. One man (last row) is peering through a pair of binoculars, and another (directly above him) is at attention and saluting, but the rest could be maintaining the boat, in battle or doing almost anything else. Again, no problems at all with the poses. These 3D printed figures glory in the benefits of the production process, with a wealth of poses having arms outstretched in ways a conventional steel mould would find almost impossible to reproduce. Equally the detail, though little-needed on these casual figures, is very good, with great faces and folds in the clothing. Naturally there is no seam, flash or excess plastic, but the style of the design is effortlessly natural, so these really are as good as you can get in the quality of the sculpting. The material used to print them is hard but not brittle, though we had to provide our own bases for the figures we painted. As we have said, this is not a typical selection of costumed U-Boat crew, but then this manufacturer is producing a series on this subject which between them will presumably cover all the bases. There are no accuracy problems, though it should be noted that none have an apparent beard, so are probably either in the early stages of a cruise or else not at sea at all. This set has excellent sculpting/design and perfect production, so for a set of crewmen wearing the cap and doing their duties you couldn’t really ask much more.